I recently read some articles on Lifehacker.com about how to deal with clothes clutter. 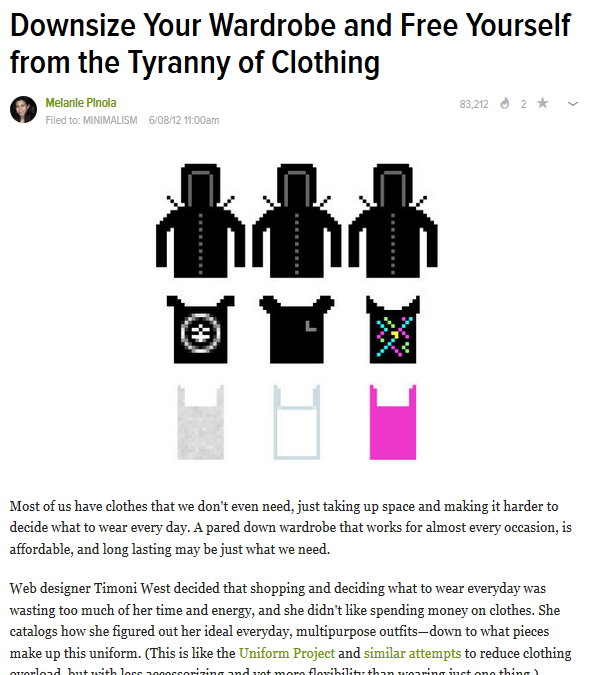 I’m a detail-oriented person, so a comment that stuck out to me was made by Michal, who said “Decide how many of each type of clothing you should have”, pare everything down, then stick to that many. So I took inventory of all the clothes I have and made a target quantity of each. The hard part, however, was choosing what to get rid of. I have way more t shirts than I need for instance, but I didn’t want to get rid a bunch all at once. I’ll let go of a few at a time, but in the meantime, knowing how much of each type of clothing I have will keep me from buying more than I need to. I just started watching Dave Ramsey on Youtube and I found this video about how to pay for a car in cash. He basically says to save what you would be paying on a car payment. After 10 months of saving you then use your cash and trade in the old car to get a new one. The car I have now, I paid cash for. But I liked the idea of saving $400/mo for my next car. I’ll also use this method for saving for my tiny house. I am always in the process of decluttering. I don’t want to get rid of all my stuff at once (I wish I could, but I like to keep a lot of stuff.) So right now I have been working on my paper clutter. I hope to get rid of over 60% of all the paper I have. My desk, night stand, some boxes, and a couple shelves have are full of papers. So I Googled ways to get rid of paper clutter and read a few articles. Something I thought of that I didn’t see in any articles was to “scan” papers by taking pictures of it with my phone. I have seen commercials with someone scanning documents with a little scanner, but I didn’t want to buy one. I have gotten rid of a 3 inch binder, one desk drawer full of papers, and more by taking pics of everything I wanted to keep (like receipts, magazines, birthday cards, etc). The auto focus on my phone works well enough for me to read everything when I upload it to my computer. I also backup really sentimental stuff on box.com. P.S. If you get Evernote and upload everything there you can search the text in images to find it later. 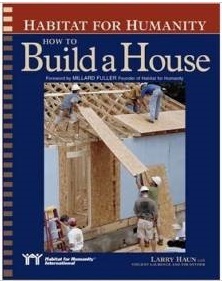 A volunteer at Habitat for Humanity told me about the book Habitat for Humanity: How to build a House by Larry Haun. I started reading it recently and I would highly recommend it to anyone who is learning to do any construction. It has some great tips and pointers on tools, materials, etc. For those who are looking to build a house, it has clear step by step advice for how to build house (a one story house with crawlspace foundation is used as an example). They will be in my area at the end of October! I would love to do something like this, but I am seriously considering making my house on a foundation, since that looks to be legal in my city. Here’s another fully legal tiny house on foundation that is being built in Pittsburg by Citylab: http://www.citylabpgh.org/blogs/tiny-houses/. I’ll be following this project closely because they are building a Minim house, which is what I want. I like the changes they made! I may have to get their plans after they finish. An “urban cottage” is allowed in MXD (mixed development) zone. There is no minium size for an urban cottage, but only a maximum of 2 people can live in 699 sqft or less. He didn’t have copies of the city code to give out, so I will just have to keep looking at it online. It was a rather short conversation, but he gave me his card and said it would be easier if I emailed him (I guess so he can look up details rather than go off the top of his head). Overall, it was a good experience. I may go to some neighboring cities and visit their city hall as well.